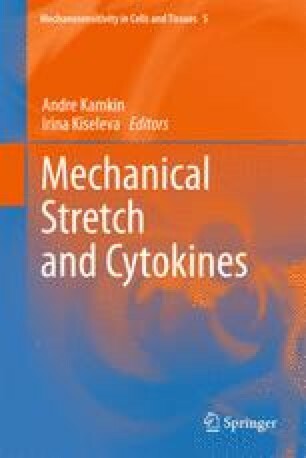 A delicate balance between circumferential wall tension (CWT) or stretch and unidirectional fluid shear stress (FSS), the two principle haemodynamic forces to which the resident cells of the vessel wall are exposed to, governs their phenotype. FSS by virtue of its stimulatory effect on endothelial nitric oxide (NO) synthase activity and expression has been designated as an anti-inflammatory and homeostatic force. In contrast, CWT has been marked as a potentially detrimental pro-inflammatory force causing, e.g. formation of reactive oxygen species, stimulation of stress-activated protein kinases and a prolonged rise in intracellular free calcium. Moreover, with zyxin localised to focal adhesions, a mechanosensitive protein has been characterised that specially transduces an increase in CWT to the nucleus of both endothelial and smooth muscle cells where it orchestrates a complex and partially pro-inflammatory change in gene expression. Tilting the balance between FSS and CWT towards CWT as the result of an inadequately low FSS, e.g. at arterial bifurcations, or volume and/or pressure overload as, e.g. in hypertension, is generally thought to be responsible for both adaptive and maladaptive vascular remodelling processes including arteriogenesis, atherosclerosis, restenosis following angioplasty, and hypertension-induced arterial remodelling. Starting with a summary of the molecular mechanisms governing CWT and FSS-mediated signal transduction in vascular cells, the differential and variable impact of haemodynamically induced pro-inflammatory gene expression on these remodelling processes is discussed herein. The authors work is supported by the German Research Foundation (DFG), the Federal Ministry of Research and Education (BMBF), the European Commission and the German Cardiac Society (DGK). We are indebted to Dr. Gerd König for the making of the figures and critically reading the manuscript.